(Lanka e News - 08.Dec.2018, 10.00PM) Sri Lanka have been suffering its worst days ever in its long history (of over 3500 years) since the Organized Coup on 26th October 2018 where the Executive President Violated the Constitution (on which he took oath that he would protect its dignity and will not violate it). He has been continuing to violate the constitution and have been engaging beyond his limits of power entitled to him by the constitution. To cover his first mistake, he has been violating over and over. Since then, we have been witnessing twisting of tongues by the President which eventually proved that he no longer deemed fit to rule this country. We have been seeing on a daily basis that his speeches are in total contradiction to his previous speeches/promises. He himself symbolically admitted that his speeches are nothing but mere words to appease the Gallery and to seek attention. As public, we have an obligation to display our dissatisfaction towards his actions over the period since 26th October. We already witnessed Many People are showing their displeasure at the President and his Men. A State Recognition Award for a Highly Appreciable Gentlemen was already returned , Tourism Industry Leader’s Decision to Boycott Awards Ceremony, The refusal of Receiving Awards from those MP’s who support the illegal move by president are good examples. 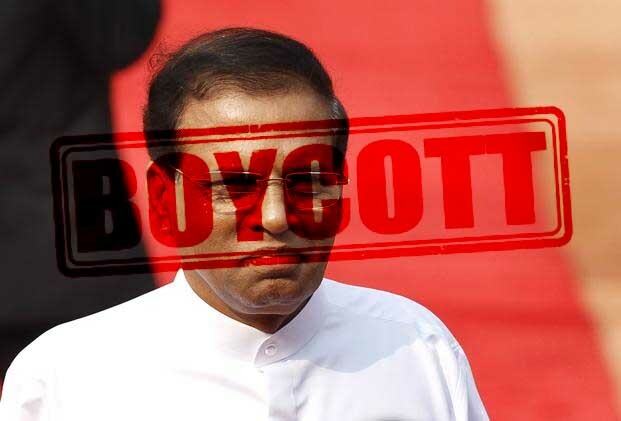 Therefore, it is high time we, the Citizens of Sri Lanka who honour the Country’s Dignity and respect the Constitution, should also set an example by BOYCOTTING ANY EVENTS OR PROGRAMMES FOR WHICH THE PRESIDENT IS SCHEDULED TO ATTEND” and show our silent displeasure towards his actions thereby teaching a lesson to anyone in the future who may have a motive of violating the Constitution or going against the country’s sovereignty. If a lesson is not taught, then it would pave way for others to follow the same footpath of the president and do things to his own whims and fancy. THIS ACTION WAS FORCED UPON THE PUBLIC TO TAKE WHICH IS NOT TO TARGET ONE INDIVIDUAL OVER HIS MADNESS, RATHER IT IS TO MAKE A LESSON TO WHOEVER MAY COME TO THAT SEAT IN THE FUTURE. WE MAY LOSE LITTLE BY DOING THIS BUT WE MUST REMEMBER THAT THERE IS NO GAIN WITHOUT PAIN. Kindly share this among your circles if you agree that the president’s actions are unbecoming. A Citizen Who Loves His Country beyond Politics.